Xertz by its very definition was constructed to quaff quickly. An extremely delicious yet not over- bearing IPA, Xertz is packed with citrusy hop flavor from Amarillo, Mosaic, Citra, Galaxy and Simcoe hops without any harsh bitterness. A balanced malt bill adds additional flavor while keeping the boatload of hops on an even keel. Drank from 20oz Sauvin glass. Bottled on 1/14/18. Look: Light amber in color with transparency. Slight unfiltered look, but more clarity if anything. I achieved about 3 fingers worth of head from a fairly vigorous (perhaps too vigorous pour). Smell: Very faint and muttled. Has a bread-y smell to it, coupled with a floral tone. I do smell grapefruit, lemon and orange, with some orange zest and lemon grass, but the floral smell is predominant. Considering having amarillo, citra, mosaic, simcoe and galaxy hops, it really is a lackluster offering smell wise. Taste: Really wasn't that flavorful as expected. I get a bready-y flavor as well, kind of dough like. Citra hops is apparent, but can't detect others. Citrus fruit flavor encompassing grapefruit, lemon and orange, with light florally notes. Feel: Light in body and weight. Somewhat watery, but has a tongue coating quality to the beer. Carbonation seems moderate. Overall: I was expecting a little more from this offering, considering the wealth of hops used. For what it is, I just don't see myself wanting more of it. 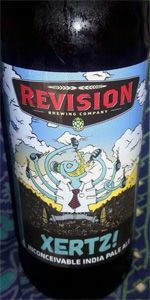 It is a light drinking beer, but nothing compared to other Revision offerings. But hey, it's part of the hobby. As always, I am grateful to have tried. Cheers! Bottle from Bottle Barn. Nothing too exciting here, gentle hoppiness comes off more as an APA. Bright yellow / golden small foamy head, ring of lacing. Malty grainy aroma. Flavor adds a touch of citrus, light astringent bitterness. Pretty gentle. Appearance - Pours crystal clear and brilliant golden orange with an off-white, two-finger width head. Good retention, resulting in a thin, broken layer of suds, thickening up around the edge of the glass. Solid amount of lacing, with broken sheeting and spotting decorating the sides. Smell - Candied orange, grapefruit and pine make up the hop profle, while malts display a light toast and caramel aroma. Taste - Light, but it has a well-developed and complex flavor profile. Candied orange with distant grapefruit and pine. Malts lay beneath with hints of toast and caramel sweetness. The finish is a light and bittersweet mix of the aforementioned flavors. Mouthfeel - Light-bodied with moderate, tingly carbonation. Super slick, easy drinker with a slightly dry finish. Chuggable quality to it. Overall - A 7% session IPA? The easy-going flavor and body say yes, but the buzz from 22oz says no. Regardless, this is a great, easy drinking brew, and maybe one of those that all can enjoy, from beginners to hopheads alike.